After many years of building Loadedvilla, I could boast of having the courage of writing this particular topic “Bad but effective ways to drive traffic to your blog.” I guess that is why Techmaga has come to stay under this particular platform. Everyday, thousands of blogs are created under various platforms; but you will agree with me that not all of these blogs or bloggers survive the wind of low traffic, no income and expensive bills backed up in the beginning of their blogging journey. This particular method has been one of the most effective methods some bloggers use to drive traffic to their blogs. With the Airtel 8181service that lets you send messages to more than 1 million subscribers for free, you will have no choice than to agree with me that this method of disseminating your blog content to other readers may be impacting on the traffic level of your blog. If you are a very consistent blogger, you will observe that subscribers who come to your blog via email invites sometimes remain your loyal visitors. These kind of visitors are are otherwise labeled direct visitors. If you can get just a handful of subscribers from other bloggers who house more than twenty to thirty thousand email address from their feedburner account or other email delivery services, then you are a step closer to increasing your traffic like magic.This is a pretty difficult task but remain effective when achieved. Personally, I do hate this pattern of marketing a blog content because it kind of tags your blog as a spam blog. This method has been considered very effective and efficient; though search engines like google tend to value blogs that enjoy massive traffic from social medias as less interactive. If you are consistent in social media shares, then you will have your own share of an improved traffic. 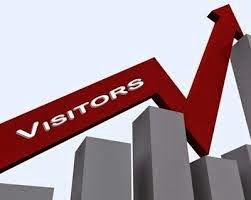 When you leave reasonable content on big blogs, you definitely will attract a lot of there loyal visitors. This does not mean you should constantly spam their comment box. Remember, you have a role to play, and as an about to be famous blogger, you ought not to spoil your online reputation for the purpose of other businesses you need to embark on. Life is all about promoting to get promoted. You can get your content promoted by joining a larger groups that encourages users to visit each other’s blog. This is one of the secrets that gave rise to one of the leading blogs you see today with numerous comments. If you really want to drive traffic to your blog, then you should be thinking of writing more unique contents for high ranking blogs you know are better or enjoy more traffic that yours. Just imagine making a publication for a blog like mashable and you are given a credit as the author which automatically points to your website. That is juicy if you will permit me to use such words. Hundreds and even thousands of traffic will be converted to yours as this invokes respect to your blog. When it comes to free things, then you got the back up of a lot of people. Since readers enjoy freebies rather than paid ones, look for possible ways to share tips that are sold elsewhere but remember to have copyrights that permits you to carry out such tasks. Do not just tweak write popular blogs. For the benefits of those that do not understand what is meant by tweak writing, I meant; re-writing an article that you see a blog publishing without having other methods to implement on that article to make it better and more enjoyable than the original source. NB: Please note that spamming is not a good thing; so I will advise you should not be into spamming groups all in the name of driving traffic to your blog. These are just a few of the the mentioned tips.Have you got any other ways you can get traffic for free? Let me know via the cute comment box below this post. Nice blog useful for those who are looking for some ways to increase traffic of a blog or website ...I am here to share some tips which increases traffic to your website .search engine optimization is the major technique used to increase traffic .Traffic is nothing that increasing the number of visitors to your site .This helps to increase the page rank of your web site in all search engines like Google,Yahoo and so on .seo services are available both at free of cost and paid service .Free services include Blog submitting , Directory submission ,Article Submission etc... but it take few amount of time to increase your traffic .To increase you traffic in short period go for paid seo service .I recommend you to have a look at TuckTail.com here they are providing search engine visibility service which helps to bring traffic to your site .They provide you with Powerful reports that show you how to move your website up in search results. Thanks for sharing wonderful article for effective traffic strategies.